The Gray Treefrogs have appeared in the yard again this season. They have been chirping from the trees for the last couple of weeks but we did not spot one until last week. They often hang out on top of particular shrubs in our yard. One favorite is the Bronze Leaved Diervilla (Diervilla lonicera). 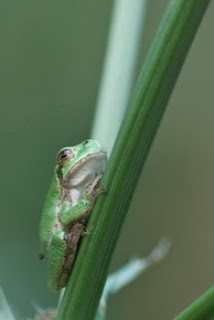 These tree frogs are very common in our area. They can be deceiving to identify because they readily change color based on temperature and humidity. I often find one hanging out under our birdbath in the dark and it will be shades of brown and gray. This bright green one in the photo was taken in full sun. They feed on insects and caterpillars. According to Stan Tekiela in his book Reptiles and Amphibians of Minnesota Field Guide, most of the frogs with a woodland habitat overwinter under leaf litter or logs. Wetland frogs will burrow in the mud at the bottom of ponds. Another important reason to leave as many leaves as possible in your yard! When we go outside after dark, there is plenty of movement under foot from the American Toads. They are busy hunting insects, slugs and spiders. During the day we will find them seeking cover under the leaf litter and in the shade of our dense shrub plantings. 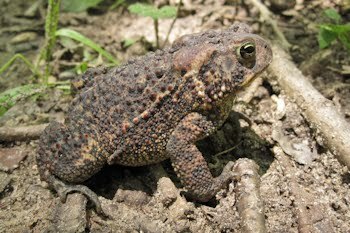 The young adult toads are amazingly tiny and easy to miss, often not much larger than a pencil eraser in size. The large diversity of native plants in our yard attracts more kinds of insects which in turn provides food for these amphibians (and birds).